Axis Of Oversteer: Bernie said : "Screw Him"
Bernie said : "Screw Him"
As we wait for Monday's decision with regards to the Piquet-Renault case, I would suggest the larger scandal is how Formula 1 has dealt with this issue so far, it has been a trial by media, using leaked information with the end results that, unless there is a videotape of Briatore propositioning Piquet Jr. we will never really learn the truth behind this affair. Why Renault, why Briatore, why now? "I asked him, what should I do? Bernie answered, 'screw him"
This again is a mysteriously out in the public domain declaration of Nelson Piquet Sr to the investigative agency Quest, in charge of gathering the facts of the inquest. Piquet Sr., according to the revelations in today's Corriere della Sera, brought his accusations against Renault and Briatore to FIA chief steward Charlie Whiting's attention before last year's Brazilian GP. "It cannot be proved" was the official's response. Piquet then kept quiet up until just before the Hungarian GP, Nelson's Jr's last race before he was sacked, when papa Piquet testified he has his exchange with Ecclestone and told him the the crashgate story. Ecclestone's answer? " Charlie already told me the whole story but we cannot prove anything unless someone comes out and testifies"
So the FIA and FOM knew about the allegations of the case but did nothing for almost a year? nice. If you take it to the dramatic extreme that would make Ecclestone, and Whiting perhaps, co-conspirators? And if Briatore was being blackmailed by the Piquets why did he cut Nelson's salary by half a million dollars and add a "non performance" clause? Surely Briatore had been in F1 long enough to know he had a vulnerability. Not to mention that cutting Nelson's salary would mean less pocket change for himself as his manager. Or did Briatore have assurances the FIA would not pursue the matter? This summer Renault was nearly given a two race ban for the lost wheel incident in, imagine that, Hungary. The ban was overturned at a meeting where the FIA stewards did not even show up. Brawn GP was not given any penalty for a spring falling out of their car and nearly killing Felipe Massa. Why is that? So again why Renault and why now. As we said before and continue to maintain, the leaked dossier's information, especially the radio transcriptions prove absolutely nothing, in fact could be readily interpreted as showing Piquet wrong. The only facts we know for sure is that Renault was put in a situation where they know they had already been convicted in the court of public opinion and that they had no hope to get a fair hearing in the court of king Max and decided it better bend over and plead for mercy. Another FOTA member bites the dust. jeesh......I tell ya.......and they dont want the americans racing???? or.... briatore is actually guilty. given all the evidence it seems pretty much case closed. if there is no truth to it why would renault not deny it? @ Michael ... Guilty or not, Renault has already been convicted, this was its only option unless they had overwhelming proof of their innocence. Remember that the FIA world council is not a court of law as we might understant one to be. "no hope to get a fair hearing"... I find this statement ridiculous. So your suggesting that because of all the press - guilty or not - they should act guilty and plead for mercy. This is a powerful Formula 1 team with a massive worldwide following. If they were innocent they would fight for months to save their reputation instead of bowing to pressure from the F1 press. It wouldn't be that hard considering PK jrs horrible driving ability. If all teams cowered under bad press - why even have team managers - lets just let the F1 press run the teams. If Renault are guilty - admit it, take the fine and move on quickly. If not - Fight to the death - the truth will eventually come out. Briatore and perhaps Renault are defending themselves in the same manner. This is not how you resolve a legal dispute. The most pointed questions now is why would Renault ever fire Piquet if it knew the guy had this sledgehammer over their heads? They were either not guilty or they had cover, maybe because of Briatore's "friendship" with Ecclestone. Maybe it was Bernie who threw Briatore under the bus? > pretty much case closed. No recordings of connivance, no emails, nothing but a bunch of snotty men saying snotty things to each other. Some people are reading the tea leaves of Singapore's telemetry as if they were conclusive... But so far as I know, nobody's compared them to the other 16 times that Nelsinho spun out. This is not about lawfulness or sportsmanship or anything but Bernie Ecclestone, the circus ringmaster. He got tired of one of the elephant acts, so it's going to be replaced. No big deal. And let's remember, Bernie's sold most of his interest in this thing, and is approaching his final years on the planet. He's as cunning as anyone in public life, but he may nonetheless be less patient with enemies than he used to be, and more willing to take risks to keep his contractual contraption running... Or even just to keep himself interested. Seems Piquet JR wants to drag F1 deep down into the S**t! He got what he wanted, why keep spewing out statements? If, as many suspect, he was the driving force behind Jrs statements to the FIA. I'm sure he'll be very happy to have ENDED his sons driving career! Even UPS wouldn't hire him now! Piquet Jr.'s luck ended when Alonso left McLaren to go back to Renault. Without the shadow of Alonso, and the forthcoming pressure caused by Alonso's presence as the first driver, Piquet could have come out clean of a couple of years as an F1 driver and acquired the hard experience that is kind of restricted these days given the minimum car testing teams get these days during the year. Piquet Jr. started his career as a test driver and when he got promoted he had both Alonso's shadow and fewer testing opportunities to improve his game. Briatore and Ecclestone seem to think about drivers in a whole different level, as if the driver had to become champion in a few years otherwise the driver became just average, too average to them. 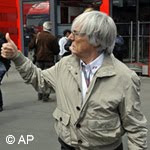 Ecclestone said so recently during a joint interview with Sebastian Vettel. 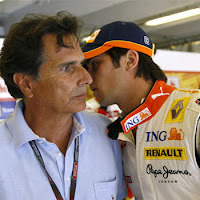 Piquet Jr. also had the pressure caused by his father. Piquet Sr. was a very outspoken guy and it all had to backfire on the son some day. Not to mention that in Brazil, where the Piquets come from, there is a culture of praising too much just the first places, the champions of the sports. It probably has to do with the media, with Globo's original monopoly of TV, so people would only talk about what had been shown on TV and Soccer and more recently Volleyball being the audience drivers and success collectors. And Senna, Piquet, in the F1. As Piquet Jr. says, he had the best first year of any Brazilian F1 driver ever. Piquet Jr.'s second year was more underwhelming. The Singapore "crashgate" was probably caused in part by the success Piquet Jr. had had in the previous race when he managed to lead some laps and finished in second place. The Alonso+Briatore duo probably wished it had been the other way, as Briatore could be said to largely ignore anyone who was driving alongside his media-attracting talent, Alonso. Piquet Jr. to me was being slowly driven away from Renault. Briatore being more of a seeder of drivers given he also made bucks from the managing contracts he got with some of them. Briatore's drivers ended up in other teams like Kovalainen in McLaren, continuing to make money for Briatore in the process. In Brazil, folks used to say that Rubens Barrichello was too unlucky. Perhaps Piquet Jr. has been very unlucky himself. Then again, Felipe Massa had his own unlucky days who? He could have become a champion and also had a severe accident. More than that, last year Ferrari had many issues in the pits that caused all kinds of issues to Felipe Massa. That from a team that used to make few mistakes. Closing up, sure there were not hard evidences against Briatore as far as we know. I just do not think it all has to do with Max Mosley and witch-hunting as many make it look like. There were many stories involving Briatore over the years though, and giving a closure to that might have been fitting nonetheless. Like the barbecue of Jos Verstappen. @ Anonymous You make some compelling points and add background and prospective that might not not be immediately available to all. I'm flattered you took the time for such an extensive comment, Axis readers are the best! Nice write-up and nice comment anonymous. I think the Renault tire incident race ban was a reactionary measure due to the Massa incident, I think the FIA realized this and that's why the ban was overturned. This has been normal for many years in F1. Now the FiA is just attempting to exercise is "real" police role for the first time to justify itself with the world and FOTA. @CG precisely and this gets back to my original point, why Renault, why Briatore, why now? It's also quite interesting how this whole affair has been covered by the press and blogs in different countries. The UK press has launched into a full fledged attack of Renault and Briatore and getting all morally outraged. (Some even brought up Vichy government nazi collaborators!). The press from Spain and Italy has been in general much more neutral about it. I'm guessing we'll never know what really happened here. To say that FIA should have examined and punished the mechanical failure of Rubens' Brawn GP car in the same manner they did with Renault's failure to secure Alonso's front wheel is a bit unfair. The spring falling out of Rubens' car was very hard if not impossible to forsee where as a bad wheelnut locking during a pitstop was immediately realised by the driver and team, yet they chose to try and complete the lap in order to get him into the pits. AC, your blog is great, and so are your posts. You don't have to be objective, I like it when you go hard on critisizing people for their actions, just make sure you are fair and compare equal things or circumstances. This isn't the first time I dissagree with you, but it is the first time I think you've gone a bit too far, being unfair, and this harms the credibility of your opinion. Finally, I understand you really don't like anything about F1's governing body, FIA. You have strongly critisized pretty much every decision they've made, but in the end F1 is still very strong and in such a financial crisis, the most expensive sport in the world is still surviving. I think you have to look at this success from both perspectives and not just assume that F1 is great due to the manufacturers and drivers. FIA has made mistakes, a bit too many in the recent years, but it has also made some good decisions, resulting in a way to the grand show we are watching recently. "FIA adviser: Nelson Piquet Jr. says that he was asked by you to cause a deliberate crash. Is that true? Symonds: Nelson had spoken to me the day before and suggested that. That’s all I’d really like to say. FIA adviser: Mr. Symonds, were you aware that there was going to be a crash at Lap 14? Symonds: I don’t want to answer that question." Then there is the clear advantage gained from it, the motive if you will. Pit early knowing their will be a safety car, take the lead. Win the race (from 10th). Renault have since accepted responsibility. They never even attempted to deny it. They knew it was an open and shut case, this isn't a stitch up. Piquet has absolutely nothing to gain, except to clear his conscience. He'll never race F1 again, and this won't change it. The reason FIA is pursuing it so seriously (compared to questionable events in the past), is because to not do so would make them look completely powerless, especially given the evidence. The damage it does to the sport is less than the damage that it would do to the sport to ignore it. Renault may have done a deal for leniency, but there is no way they'd have plead guilty if they weren't as the damage it has done to the brand and team image is enormous. If they didn't have a case to answer they would have fought it. @Michael @John The only real "proof" they have shown so far is Symond's non answer. Guilty or not this was a trail conducted not with "seriousness" by the FIA but in the court of public opinion. Once information was leaked and leaked with a complete narrative, I think Renault was in a no win situation. Again, I would like to know how much does this have to do with Mosley's personal vendetta's. The FIA world council is a kangaroo court with delegates admitting they have not read any of the papers in the case and more worried about keeping their job come Octobet. In regards to proof, there is actually quite a bit, but we have only access to some fraction of it. First, not mentioned yet, were the leaked team transmissions. In regards to telemetry, other laps data was available and was compared, and there was a lift in other laps and no lift on the lap where he spun. The interview with Pat Symonds is evidence and sections were quoted above. Renault F1 had access to a larger fraction of the evidence and upon review expelled Pat and Flav. Flav had a tremendous amount of clout and thus they would have not made that decision internally lightly at all. So I dont agree that it is a witch hunt. In fact I am surprised that the decision was so light. The strategy itself was something never before tried and therefore how Alonso didnt know about it is very hard for me to accept. Alonso must have known something about the crash plan in order to accept the decision to try this radical fuel strategy. Also, I believe Flav did not concoct this plot solely. I am sure other executives sorely wanted a win and there was a joint panel to develop this idea. We will never find out since Flav was missing. He might have done a New Jack City where when on the stand he named names of others who were invovled. Having been a huge f1 fan for over a decade and having attended races in China, Japan, Canada and US, it reduces my enthusiasm for F1 that the investigation seems to have stopped short of finding all the players and a full cleaning. I recognize that there is no hard evidence that Alonso knew, but still find it hard to believe that he did not suspect anything. Also, it is disturbing that FIA knew about this and did nothing. Finally, the why now is a great point. Clearly PK wanted revenge but then why would Flav cut him knowing that PK could get his revenge. There are details missing and it would only be good for the sport to get all these items cleaned up.